Sorry, a bit late on this and not a lot of time to offer up detailed thoughts so here we go with my picks on who wins and loses this weekend keeping in mind I don't/won't pick draws... my record without picking draws now hovers at 51%. New York at home to Portland - I've already offered up my thoughts on my home blog about this one. If the Timbers don't make mental mistakes, don't get a red card, don't yield a Penalty Kick and don't score an own goal I think they win... Timbers take three. This game wasn't too much different than any others for New York this year - they played passably but were lackluster, especially in the final third. 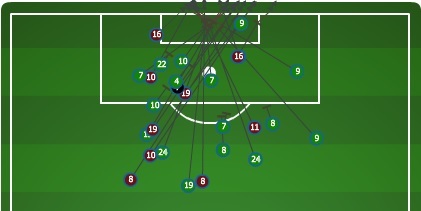 As the image above shows, Red Bulls certainly saw enough of the ball in the attacking third to get a goal. But far too many of the possessions in attack were basically in slow motion. 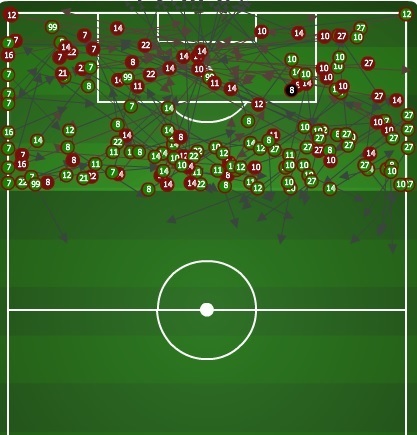 The Red Bulls sent in 36 crosses, yet none of them led to a goal. 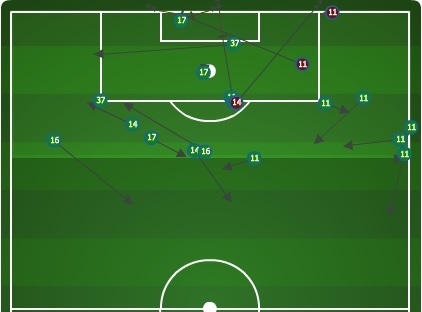 To build to these crosses, New York slowly passed the ball around for two minutes then fiiinnnaallllyyy got the ball to the flank to be sent in. This slow play let DC's back line get set and ready for any attack. If New York wants to regain last year's Supporters' Shield form, they'll need to find some urgency in attack and build some moves before allowing the opposition to get settled. This game wasn't terribly interesting from a DC standpoint (they nicked an early goal from a set piece, then defended resolutely to eke out a 1-0 win), so I'm going to use this space to wax philosophical about this team and the state of the league. United re-made their roster this offseason with veteran MLS players, so much so that the starting lineup this week averaged 152 career games. And that includes two guys who drastically bring that number down: Cristian Fernandez (new to the league this year) and Andrew Dykstra (the team's usual backup 'keeper). Now, experience doesn't mean talent, and a criticism can be made that DC lacks difference makers. But if you took this same roster and put them in the 2010 MLS season, I have trouble imagining that they would miss the playoffs. Here in 2014, they'll likely be in a season-long scrap for one of the final playoff spots. 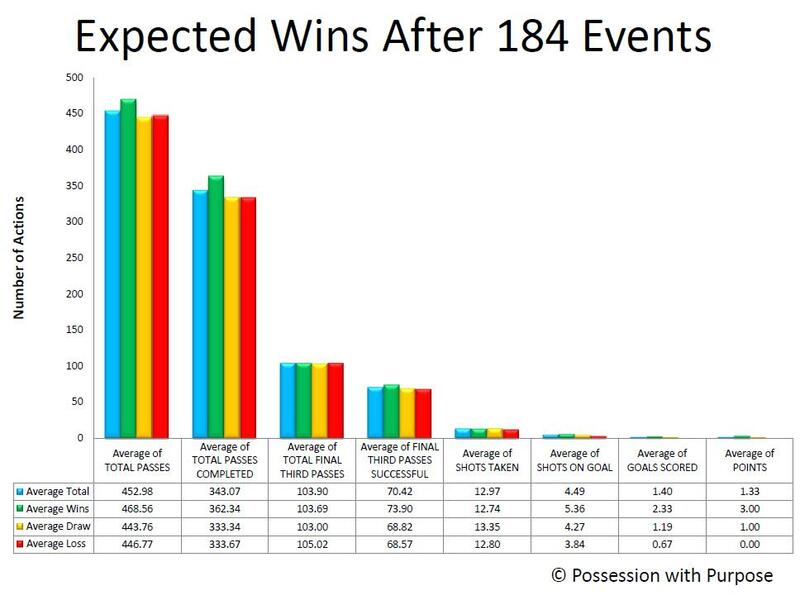 I don't mean this shpiel to diminish DC or their roster; I just want to make a point that MLS has clearly improved over the last several years to a point where even a very solid roster will have trouble making the postseason. Not all 1-0 soccer games are boring, but this one definitely was. Sorry. The biggest thing that I gleaned from this one about TFC had to do with their central midfield. Kyle Bekker, a high-potential but so far low-performance Canadian, put in a fantastic performance for the Reds. This is only one game and I'm prone to hyperbole, but he kind of looked like a young Michael Bradley in the way he commanded the game. Contrast that with the performance of his midfield partner, the veteran Jeremy Hall. 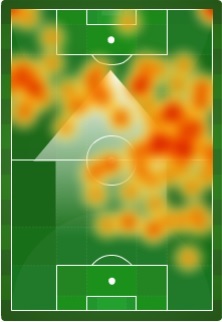 Hall isn't the same type of player as Bekker, better suited to playing sound positionally than creating chances, but he was clearly less influential than Bekker. This isn't meant to be a criticism for either player or Toronto as a club - the fact is, these are the team's third and fourth central midfielders, which means they're pretty well off as far as MLS teams go. For the second game in a row, Pablo Mastroeni started a midfield of Jose Mari, Nathan Sturgis, Dillon Powers and Nick LaBrocca. All four of those guys are central midfielders by trade, putting them in a diamond shape that doesn't provide much width. 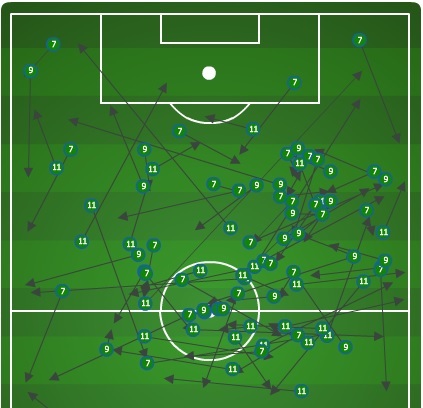 The fullbacks (especially Thomas Piermayr) and forwards (especially Gabriel Torres) did a decent job of providing that width, but the cramped midfield still struggled at times. 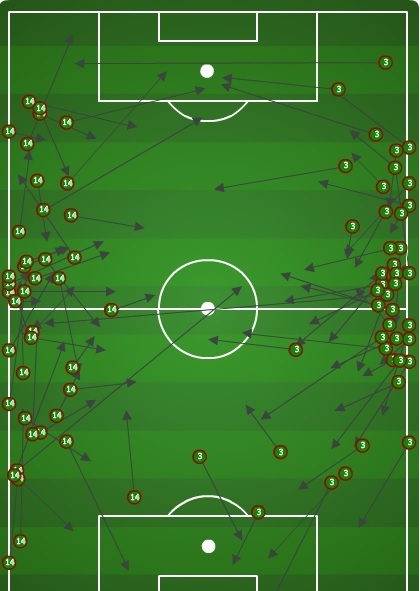 Moving the ball through the midfield was a task for the Rapids, and switching the field from one side all the way to the other flank was quite a task for the squad. It comes as no surprise that the game's only goal came from one of the few successful switches of field that the Rapids pulled off; they'll need to continue doing that in the future whether they stick with the diamond midfield or not. Last week I wrote about LA's diamond midfield and how successful it was against Chivas. I left out a big part of why this was successful: the interchanging of the forwards with that diamond midfield. In Robbie Keane and Landon Donovan, the Galaxy have a couple of special players who don't fit the mold of any particular type of striker. 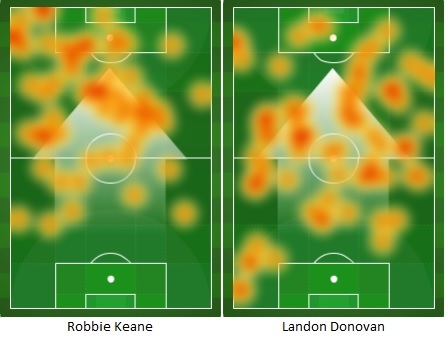 Both of these guys' heat maps were all over the place against Vancouver, and it was their checking to the midfield and midfielders' willingness to run forward into the space that made them hard to defend. LA only scored once, but they looked dangerous on many other occasions thanks to this interplay. Vancouver has been starting two defensive midfielders for most of this season, generally featuring Matias Laba and Nigel Reo-Coker. Reo-Coker's poor play to start the season led to his benching in Los Angeles, and they were forced to throw regular winger Russell Teibert into that role this weekend. He looked better there than the usual guys, mostly because he has so much ability as a chance creator. Teibert gets pigeon-holed as a pure attacker, but he actually showed a real good ability to break up midfield play and keep possession in the holding role. Teibert played there some for the 'Caps in preseason as well, so I'm not sure where he fits in their long-term plans. I for one would vote that he sees more time in a holding or box-to-box role: he was a major reason Vancouver wasn't stampeded a la Chivas in Week 5 and brings a spark going forward that can also be helpful in that position. MLSAtheist and timbertyler tied for first place with 13 correct answers each (out of 20). Normally, we would have gone to the tiebreaker to determine the grand prize winner, but MLSAtheist, a valued contributor to American Soccer Analysis, graciously decided to withdraw his prize eligibility. 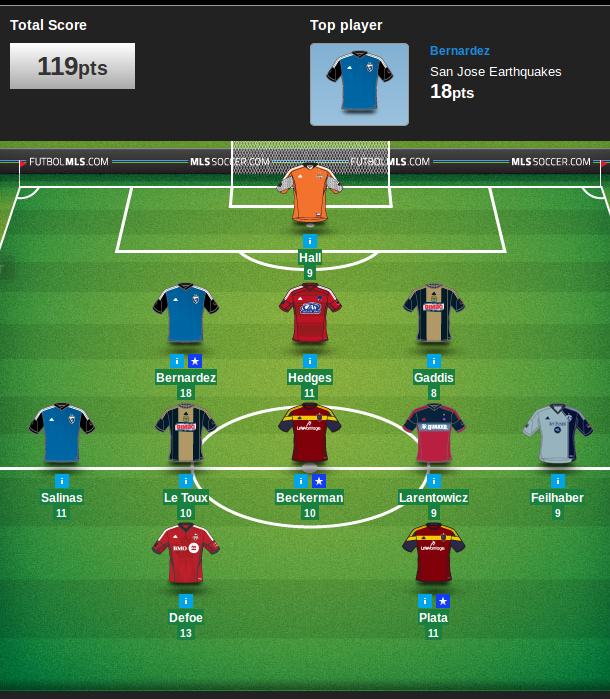 That leaves timbertyler as the winner of a subscription to MLS Live 2013! Congratulations to timbertyler; maybe Portland will follow his lead and start amassing some wins of their own. First Kick is imminent! Get 'em in! 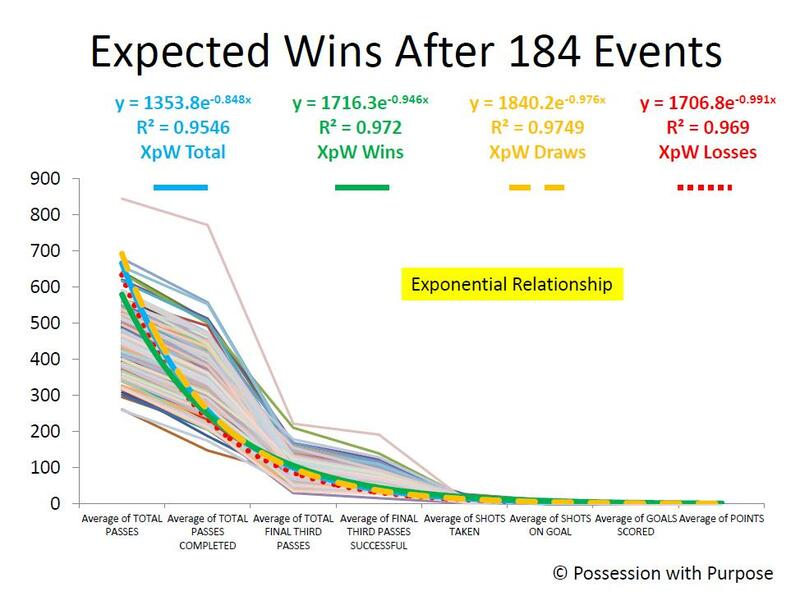 For the first two weeks of the season, we are running a prediction contest to see who can best pick MLS and CCL games. If you answer the most total questions over the next two weeks, you win a subscription to MLS Live 2014. 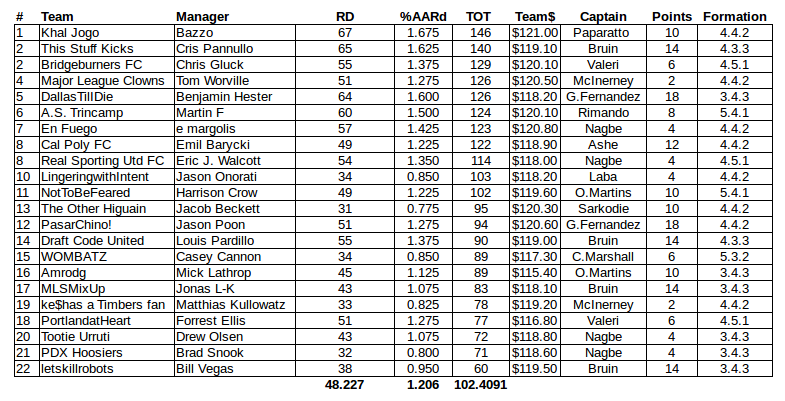 Only followers of American Soccer Analysis on Twitter (@AnalysisEvolved) will be eligible for the prize. We are doing this for two reasons: One, shameless self-promotion (well, we feel some shame, but we’re doing it nonetheless), and two, simplicity. We do not have to collect anybody’s name or personal information except for their Twitter handle (though if you have a Twitter account, let’s face it, you’re probably begging for the world’s attention anyway).